Television, Internet & Video Association of DC - First Thursdays: Program Finishing - Color/Mix/Specs Oh My!! First Thursdays: Program Finishing - Color/Mix/Specs Oh My!! Got a program or video that’s almost done but still needs some pizzazz to really look its best? 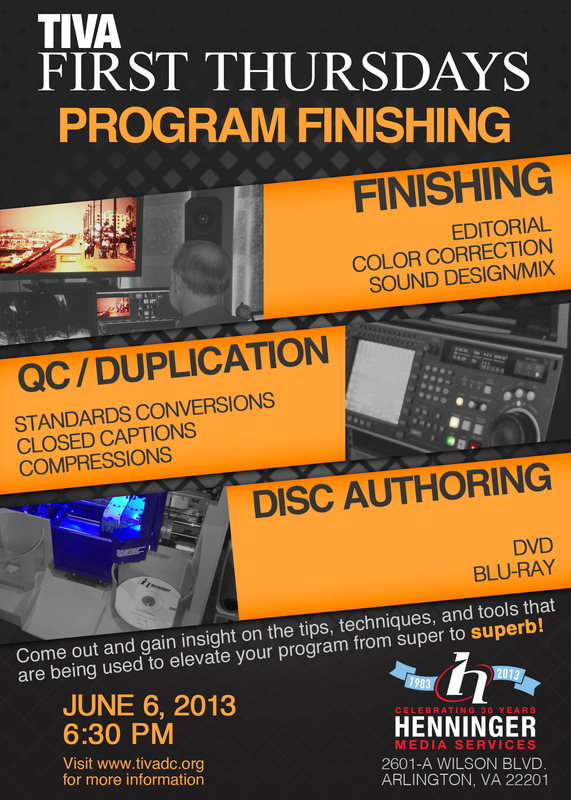 Come to Henninger Media and let their talented professionals show you how to take your work from super to superb. Learn what techniques work best, what to avoid and what tools can be a real asset to your work. -Stereo, Split Tracks, 5.1 Surround, 7.1 Surround. -24 or 30 fps for broadcast. Does pulldown look good?